Since I have become a ( somewhat ) diligent blogger now for the past year. I think it would be easy for me to look back at my resolutions later this year ( online) to see if I have accomplished them! ( So optimistic! I think most likely I would check back at the end of 2012! ). I think having a resolution post as my first post of 2012 is quite appropriate! 1) Be a better cook! - I think this is somewhat a must for all girls. or perhaps all humans! Since we all need to eat! I was doing my quickbooks over the weekend & I feel like I eat out way too much! Even though I realized that already over the year. I kind of just let it go & made it part of my life. I think it is not good. Since I usually eat fast food~ My body is definitely not as slim as I would like it to be. >_<! So I think learning to cook better and learn to bring myself different meals for lunch would be a great way to save money and control my health better! 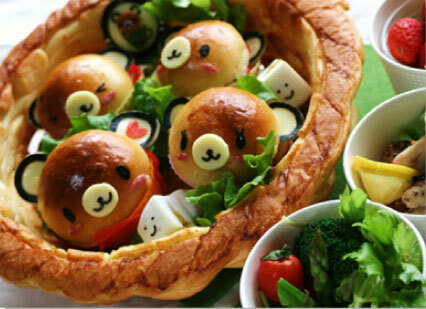 I always envy people who can make such pretty bentos! This has been my goal since last year I think. I was somewhat proud of myself when I had it good for a while. However, when school came around it became pretty much impossible to go gym now~ Now that school is out right now. Might be easier to start gym again~ My goal is to have a better habit go going to gym this year. Especially on weekends! I have no excuses! It is one of my talents that would be horrible to go to waste. But with school and work ( plus blogging!) it seems I have no time for it. ( because it is so time consuming) Although I still play, but I truly miss it sometimes when I am super busy. I think having music in my life is like having a friend who needs time and attention to make the relationship work! I hope this year, I can be a better friend with my piano! 4) Be a better Vblogger! Only starting recently that I been starting shelling out $ to take care of myself. I think blogging somewhat motivate that for me! Since I see so many beauty bloggers~ I feel so inadequate in taking care of myself! My mom has always taught me to not waste money on unnecessary things. Buying “unneccessary” beauty products seems to be one of them. Although she’s not really cheap about skin products now, but she doesn’t do any research before purchase a product like I do. Which I think can often turns out to be a waste, when products doesn’t suit her skin type. Alright, I think that’s all the plans I have for this year. Not going to name out every single little things that I need to improve ! Small steps! So I can actually achieve them! Once again, Happy New Years Everyone! Stay tuned for vacay pix next! I posted my resolutions on facebook but I should take care of my skin more too. Everyone should! :) I need to buy more products soon because I'm running low. I hate being poor but I refuse to give up my Oil of Olay!! XD I want to try that Roc wrinkle cream too! Haha~~~ True. I hate being poor too~ but taking care of myself should be one of the priorities!!! Thanks! Happy New Years to you too! ~ I’m sure you can still improve without making a list~ =P I make lists all the time, but the hardest thing is follow through! And I agree with the taking care of your skin part too, especially since we're in our mid 20s now and this is when anti aging prevention is most important :) I agree with you that it is more wasteful to buy skincare products without researching first; I always make sure I read plenty of reviews and do comparison shopping before splurging on pricey skincare products. I've come to a point in life where you just let life run its course and let it determine how a year goes. So I don't really care for New Year's Resolutions. They are just promises you know you can't hold onto even if your life depended on them. I will say this about one resolution- you are a great video blogger (vlogger). I'm not saying that just to make you smile, but because it's the truth. You know you have me as support for all of your vlogging adventures. I enjoy watching your videos and hearing your sweeter-than-sugar voice and seeing your candy-sweet looks. So keep up the great work! =D Thank U ~ for the kind words n support~ I haven’t made resolution for years but so far I am pretty good at the Food part~ because I have bought my own lunch for a complete week! <3 Let’s hope it lasts!